Forget those pasta salads from your childhood with tons of mayonnaise, boring vegetables and little flavor. These pasta salad recipes are much more creative and satisfying. And they go well with just about any picnic food, from burgers to fried chicken. This is one of the more popular pasta salads I make for summer parties and picnics. Feel free to substitute your own favorite vegetables for the ones I've chosen, but try to keep the marinated artichokes. They lend such a great flavor to this dish. 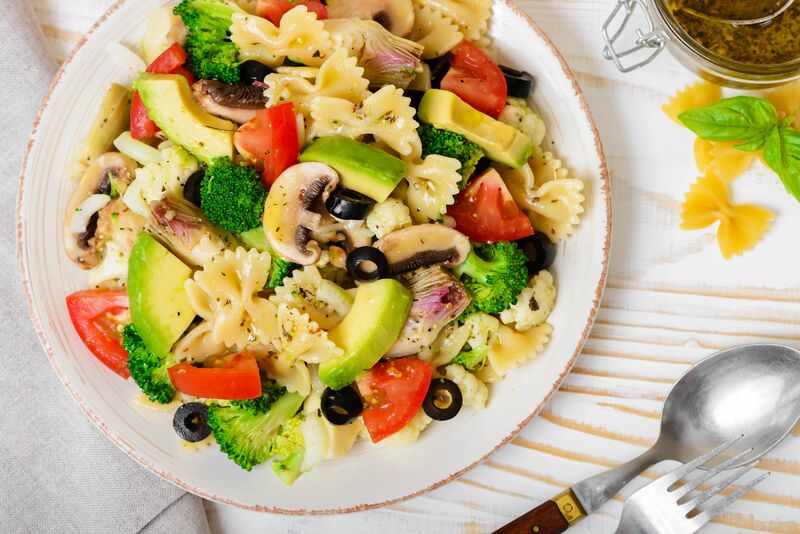 Refreshing and hearty, this is one of those pasta salads that could be served either as a light main course or a side dish. Feel free to add more bacon if you want a heartier flavor. This hearty pasta salad has all the flavors of great Tex-Mex food: black beans, corn, jicama and red bell peppers. Feel free to substitute chicken for the steak if you prefer. There's a local high-end grocery store in my neighborhood that makes a tuna pasta salad everyone just goes nuts over. But it is so simple to create it at home. This is my version, and I have to say it is darned good. I especially like the fact that I don't have to pay $6.99 per pound for it! You will find all the flavors of a great Greek salad in this pasta salad recipe, including cucumbers, black olives, tomatoes and feta cheese. A Greek salad dressing brings it all together. Serve with my moist and juicy turkey burgers. Black beans, red peppers, corn, Mexican cheese and jicama add Mexican flavors to this hearty pasta salad. This is a great side dish for my chicken fajita recipe. This is a very healthy pasta salad, made with whole wheat tortellini, zucchini, red peppers, onions and mushrooms. I like to make this salad in the summer when the zucchini is plentiful. Feel free to add or substitute different vegetables if you like. A red pepper dressing keeps this salad light. If you like this recipe, check out my baked tortellini with chicken and spinach. It's a hot comfort food dish that's always a hit with the kids. This is a very simple, four-ingredient salad that goes well with just about everything, and it travels well, too, making it a perfect bring-along dish for potlucks and parties. If you want to switch things up a bit, try making this pasta salad with kale pesto. Fresh apricots, whole wheat penne pasta and pecans add sweetness, nutty flavor and texture to this wholesome, healthy pasta salad. This dish makes a great healthy lunch idea for the kids. Why include couscous salad in this recipe collection? Because couscous is technically pasta! This recipe tastes great in the summer when zucchini and red peppers are in season. I use instant couscous for this recipe.